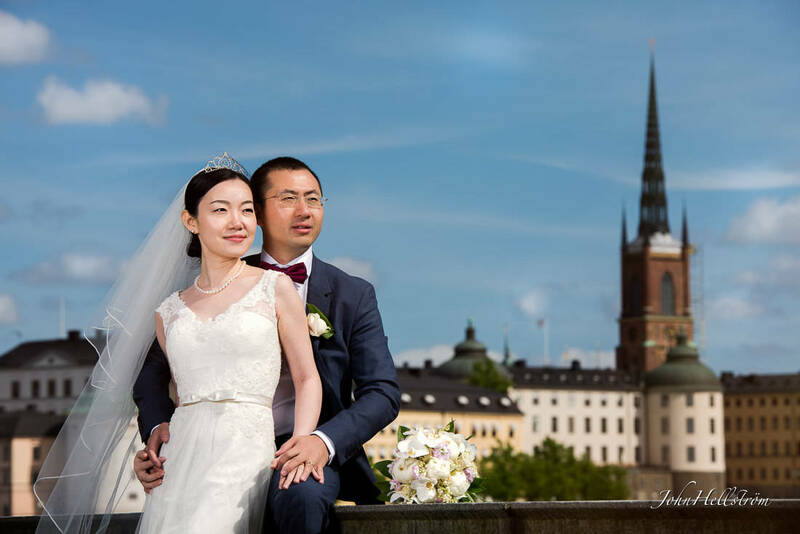 Lu and Qiang got married in the Stockholm City Hall, and I was honored to be their wedding photographer. The ceremony was held in the tower. We took the opportunity afterwards to take portrait photographs around the City Hall and by the waterfront. City Hall in Stockholm is located centrally in Kungsholmen on Lake Malaren. It took 15 years to build the house, which was inaugurated Midsummer June 23, 1923, near the 400-year anniversary of the arrival of Gustav Vasa in Stockholm. The architect Ragnar Östberg has been said to be inspired by the Doge Palace volume and arcades of the water and the St. Mark's Campanile Church, both located in Venice. City Hall has influences of both Italian architecture, as Nordic Gothic and Islamic art. It is 106 meters high and among its mess halls known is the Blue Hall, the Golden Hall and the Prince's Gallery. Stockholm municipality administration and management work there. The annual Nobel Prize ceremony also takes place in the City Hall. You can find guided tours of the City Hall here. John Hellstrom is a portrait and wedding photographer from Sweden. Contact John here.